Who are the best-known citizens of Los Angeles? Tough question, does anyone immediately come to mind? Certainly, an A-list celebrity, or athlete might be, but what with Beverly Hills and Malibu technically outside LA, who knows? Is it the mayor, or maybe the police chief? The Governor of the golden state may be California’s best known. New York has Trump and his tower, but what, or who do Angelenos claim? These may well be questions worth revisiting somewhere else in time, say 105 years from now. For it is from that time perspective the events of 1902 can now be considered. Recognizing one of LA’s bestknown citizens from that year is simple. The answer was printed in the Los Angeles Times, in a story describing horribly unfortunate circumstances, but revealing chapters in Department history that have converged here at the historical society. All of them involve the sergeant, and soldier depicted here. Research relating to two different subjects revealed the importance of this officer who was also a prominent member of the community and the first officer above the rank of Patrolman to die in service. Sanford G. Morton is one of those stories lost, or at least obscured, over time. His was a life of service pledged to a divided nation and a newborn city. His was a death preceding official records of such matters. His story is worth sharing in recognition of all of those lost, officially recorded or not. S g t . M o r t o n ’ s portrait resides at the historical society. This 1892 photograph is part of the department photo array from that year. The society is fortunate to have 71 of the original 75 portraits, and Sgt. Morton’s is one of the most distinct and telling portraits in the collection. Only four individuals were photographed wearing their hats. Captain Billy Roberts, the first captain in the department’s history is one of them. The remaining three are the sergeants of the department. These were neither sergeants I nor sergeants II. They were, however the department’s first sergeant, second sergeant and third sergeant. The trio of supervisors was distinguished not just by title, but by a small pendant affixed to the bottoms of their eightpointed stars. Examination of these metal tabs led to their identification, and ultimately to the stories behind each of the three pioneering police supervisors. Trouble befell one of them and tragedy befell Morton. Sgt. 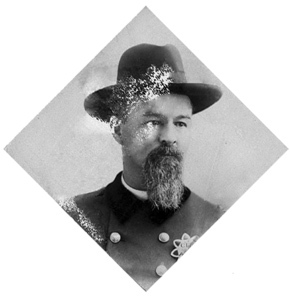 Morton was nearly 44 years-old when he joined the LAPD in 1886. Regardless of era, this is an advanced age to enter police work, particularly given Morton’s life experience. At the age of 18, Morton answered the call of President Abraham Lincoln following the bombardment of Fort Sumter. He enlisted with his home state ultimately becoming part of the 16th Michigan Volunteer Infantry. It was an assignment that took him to battles at Chancellorsville, Antietam and Gettysburg. Morton was wounded in combat three times, and the night of his scheduled leave nearly led to his demise. While preparing to leave for home, Morton was tapped to fill in for a fellow soldier who had fallen ill. While walking guard duty, Morton was injured by an artillery shell and captured by Confederate soldiers. Morton was imprisoned at Richmond’s notorious Libbey prison where he neared death. Morton was liberated by a prisoner exchange, but his health was so poor his family gave him up for dead. After years of recuperating, Morton was able to return to his trade, carpentry. In 1868 he married, but remained in Michigan. Morton and his family later came west settling in California during 1884. In August, 1886, Morton joined the police department and came to be known as one of the department’s best officers, universally popular with his subordinates and a cool, honest and painstaking officer in the eyes of the public. While on-duty and in uniform, Morton was riding a Grand Avenue trolley car when he collapsed due to a stroke. Morton never regained consciousness and died eight days later, just three days after the death of his son. Gone was a father, son, husband and brother, a soldier and sergeant, and a POW turned police officer. Sanford G. Morton was laid to rest with his son Frank on July 2, 1902; five years before line of duty deaths were officially recorded. Morton left behind a wife, four children and a portrait of one of LA’s best-known citizens. Activity abounds, and so does opportunity. Quickly approaching are some wonderful opportunities for us to share our history and for all of you to enjoy our history. We are busily preparing for our participation in a number of events both here in the Highland Park community and elsewhere. Each presents a great opportunity to reveal bits of the LAPD past while interacting with young and old alike. First on the list is an appearance at the Museum Magnet School to assist them with the celebration of their annual museum day. Located not far from us on North Figueroa street, this public school educates youngsters who have an early interest in museum careers. A number of museums assist by providing activities or static displays for all of their visitors. Last year’s event was very well received and very well attended. The children greatly enjoyed our vintage black and white. This year’s April 28th event promises to be equally successful. Another event LAPM will be supporting arrives not long after. On May 7th, the annual police officer memorial ceremony will be held at the Police Academy. Given that this year marks the centennial commemoration of the first recorded loss in the line of duty, the historical society will be playing an important role. We have completed much research and will be providing the background on the losses of our first two officers, Clyde A. May and Patrick.H. Lyons. Both were shot and killed in the line of duty one-hundred years ago. Both were tragic losses, so we will be helping to honor their sacrifices. It’s later in the month that a truly exciting and fun-filled day shows up. For the first time ever, LAPM will join the museums of the arroyo collective as part of the annual Museums of the Arroyo day. On Sunday May 20th, LAPM will join five other museums along the Arroyo Seco to offer a day of activities, free admission and free shuttle service. It is a day when visitors can park at any one of six museums and ride free shuttles to visit any or all of the museums. LAPM will serve as a hub, offering parking onsite and shuttle service to the Gamble House, Heritage Square, the Lummis Home, the Pasadena Museum of History and the Southwest Museum. Many great activities are planned and this is a wonderful opportunity to see and explore a historic section of our community. For more information, contact LAPM at (323) 344-9445 or visit www.LAPM.com or www.museumsofthearroyo.com. Putting all of these events together, and getting them done requires some talented assistance. For this we have looked to our pool of dedicated volunteers. Keith Ricks, Angie Roman, Tracey Schuster and Lucinda Martinez have been busy on these and other projects making sure we continue in our efforts to collect and preserve. Along those same lines, we have received some wonderful donations in the past few weeks. Thanks are due to Carl Casabian in memory of his father Earl Reddick and Rita Kimberly in memory of her husband Myron Kimberly. Betty Markley also contributed a great academy class photo from 1948 which commemorates her husband, Harold. From the collective past of LAPRAAC and the LAPD, Bob Burke came forward with a terrific donation of photos and artifacts. Not to be outdone, our highest ranking supporter, Chief Bratton recently forwarded a copy of the 1937 Guardian. The Chief remains a true benefactor and a diligent partner in our daily endeavors. We also owe a hearty thanks to Officer Jim Ungari for his support in the graphic arts department. Jim is a truly talented soul who will, and can, do anything to make the department look better!